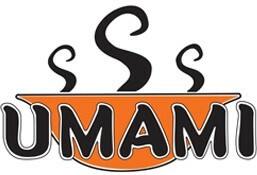 Umami is currently closed for delivery and it will open at . Our house shoyu dashi broth with noodles, sirloin beef or chicken breast. Vegetables and other garnish include (purple and white cabbage): Garnished with sesame seeds, spring onion, nori and half boiled egg. Our house shoyu dashi broth with noodles & 3 pcs of prawn tempura. Vegetables and other garnish include (purple and white cabbage): Garnished with sesame seeds, spring onion, nori and half boiled egg. Steamed rice topped with grilled thigh, marinated in our house made teriyaki sauce. Teriyaki sauce contains, sugar, ginger, soy sauce, and garlic. The bowl is garnished with purple and green cabbage, carrots, spring onions and sesame seeds. Steamed rice topped with grilled beef ribeye, marinated in our house made teriyaki sauce. Teriyaki sauce contains, sugar, ginger, soy sauce, and garlic. The bowl is garnished with purple and green cabbage, carrots, spring onions and sesame seeds. Steamed rice topped with beef sirloin and roasted onions. The plate is garnished with togarashi powder, red ginger, pickled daikon and spring onions. Steamed rice topped with salmon and tuna marinated in citrus sauce. Garnished with fresh mango, avocado, cucumber, seaweed, crab potato salad, spring onions, tobiko with black and white sesame seeds. Steamed rice topped with chicken thighs mixed with onions and egg. The plate is garnished with donburi sauce and nori. Steamed rice topped with grilled salmon, marinated in our house made teriyaki sauce. Teriyaki sauce contains, sugar, ginger, soy sauce, and garlic. The bowl is garnished with purple and green cabbage, carrots, spring onions and sesame seeds. Steamed rice topped with marinated BBQ eel. The plate is garnished with donburi sauce (soy sauce, hondashi powder and sugar), carrots, purple and white cabbage. Steamed rice topped with panko crusted chicken breast. The plate is garnished with donburi sauce (soy sauce, hondashi powder and sugar), slightly scrambled egg, carrots, purple and white cabbage. Steamed rice topped with salmon and tuna sashimi, boiled shrimp, tamago, crab stick and tobiko. The plate is garnished with sliced cucumber, purple cabbage carrots and radish. Steamed rice topped with teriyaki chicken garnish with picked cucuber, kimchi, white cabbage and daikon. House made Udon noodles mixed with your choice of chicken or beef strips, white cabbage, carrots, green capsicum, ginger and garlic, and topped with nori and spring onions. The noodles are tossed in a yakiudon sauce which contains oyster sauce, soy and other ingredients. Udon noodles with Japanese curry with choice of chicken or beef. Japanese curry sauce garnished with carrots, radish, bok choy, fresh onions, cauliflower, red, yellow, green bell pepper. Choice of chicken, beef, or vegetable fried rice, mixed with egg fried rice brown sauce, white onions, spring onions, eggs, carrots and green beans. Roll includes crab, shrimp, sushi rice, nori, tobiko and Japanese mayo. Garnished with wasabi, gari and sushi sauce. Roll includes shrimp, sushi rice, nori and tobiko. Flour is included in the tempura batter. Garnished with wasabi, gari and sushi sauce. Slices of raw ahi tuna or salmon served with wasabi, gari and sushi sauce. The plate is garnished with daikon, carrots, cucumber and lemon. Roll includes salmon, cucumber, dynamite sauce, sushi rice and nori. Garnished with wasabi, gari and sushi sauce. Roll comes with salmon or tuna and with fresh avocado, sushi rice, nori, tobiko and Japanese mayo. Garnished with wasabi, gari and sushi sauce. Mix of romaine lettuce and mixed wild greens, topped with grilled salmon glazed with teriyaki sauce. The salad is garnished with an assortment of seasonal vegetables that include, cucumber, carrots, green beans, breakfast radish, broccoli and red onions. The salad is tossed with an Asian Style vinaigrette. Mix of romaine lettuce and mixed wild greens, topped with our teriyaki chicken. The salad is garnished with an assortment of seasonal vegetables that include, capsicum, red onion, peas, cucumber and carrots, green beans, tossed with an Asian style vinaigrette. Mix of romaine lettuce and mixed wild greens, topped with our teriyaki chicken. The salad is garnished with an assortment of seasonal vegetables that include, capsicum, red onion, green beans, cucumber and carrots, tossed with an Asian style vinaigrette.